In a situation eerily similar to Rich Hill of the Dodgers, the Toronto Blue Jays have placed starter Aaron Sanchez on the DL just one inning after he returned from injury. Sanchez made just two starts this season before the Blue Jays placed him on the DL because of issues with a blister, much like Hill has struggled with the past two seasons. After two weeks on the shelf, Sanchez returned from the DL to start Sunday against the Tampa Bay Rays. However, Sanchez lasted just one inning on Sunday before he was forced to leave because of a split fingernail on his pitching hand. While he was on the DL, Sanchez underwent a medical procedure to remove part of the fingernail from his middle finger in hopes that it would make his blister issues a thing of the past. But when the nail split at some point during the 13 pitches Sanchez threw in the 1st inning Sunday, it was obvious he couldn’t continue. The Blue Jays are now hitting the reset button on him by putting him right back on the DL. Blue Jays manager John Gibbons was coy with the media following Sunday’s game, not wanting to let on if Sanchez would be going back to the DL or how much time he may need to miss this time around. Sanchez immediately returning to the DL is yet another circumstance that figures to interfere with the Blue Jays overcoming a terrible start to the season. The 24-year old was one of the best pitchers in the American League last season, and with a similar performance in 2017, he was poised to lead Toronto’s rotation. But things have not played out that way for the Blue Jays. 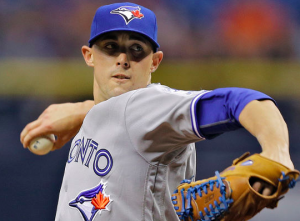 In addition to getting just two legitimate starts out of Sanchez, the Blue Jays have also lost J.A. Happ to an elbow injury. Sanchez and Happ were a combined 35-6 last season, so they are arguably the two starting pitchers Toronto could least afford to lose this year. On top of that, Josh Donaldson and Troy Tulowitzki are also on the DL, depriving the Blue Jays of their two most impactful offensive players. A bi-product of all those injuries was the Blue Jays going 8-17 during the month of April. As May gets underway, Toronto finds itself nine games under .500 and eight games out of first place in the AL East. Even fully healthy, the Blue Jays would have their work cut out for them, and with all the injuries they are currently fighting through, getting back into contention is difficult to fathom. If there’s a silver lining, it’s that the Blue Jays have gotten a couple decent starts out of Mat Latos while both Sanchez and Happ have been on the DL. There is also hope that Happ will be ready to return by the time Toronto needs another starter to fill Sanchez’s spot in the rotation. Nevertheless, Sanchez continuing to have blister problems is disconcerting for the Blue Jays, as there’s no timeline for his return and no guarantee he’s able to put the blister issues behind him permanently.